Goal: Our aim is to aid in the recruitment and retention of young male singers and further their vocal development. We also strive to foster interest in male singing and combat negative stereotypes associated with singing in high school. Our ultimate goal is for your students to take both their learned skills and enthusiasm for singing back to your classroom. Who should I bring? You can bring any of your male high/middle school vocalists. However, please only bring students whose voices have changed and are ready for the vocal range of TBB repertoire. You do not need to bring a balanced group; we will work with all of your students! Bring as many as you can, the more the merrier! Can our male ensemble perform? YES! We would love to have you perform one or two selections in the culminating concert. When you check-in the day of the event you’ll have the opportunity to give your performance information to the faculty. Chaperones: We expect each director will accompany their students. If it is customary for your district to require additional supervision, your chaperones will be more than welcome to join us for lunch and the day’s festivities. Registration table: Students will be ready to check-in your school between 8:15 – 9:00 the morning of the event. Music: We will be performing up to 3 pieces with at least one combined piece where the men of the WSU voice area join your singers. We will send music to you with your festival packet. Preparation: As with any festival in which students come together to perform, it is imperative that your students be familiar with the music prior to the event. While the performance is informal, we hope to perform at a level that is commensurate with our aspirations as directors and help to inspire the performers involved. Practice tracks for each of the pieces will be sent to the directors via email. Repertoire will not be memorized for the performance. Performance Attire: The attire is casual: Festival T-shirt (included in your registration fees), jeans, and sneakers/casual shoes. Folders/Binders: Please have your students bring a black folder/binder for the performance. Even if your students feel the music is memorized, please have them bring it nonetheless. We often refer to specific areas in the music by measure numbers and want to communicate effectively with your students. Festival Concert: The final concert will be free, open to the public, and will take place on the WSU-Pullman campus around 3:30 PM the day of the event. Lunch: Lunch is provided for students, directors, and chaperones. Students will enjoy pizza! Your students are also welcome to bring a brown bag lunch which meets their specific dietary needs. Students should also feel free to bring snacks to have during our breaks. However, please inform your students that they should eat either in the hallways/lobby areas and cannot consume food in the house of Bryan Hall Theatre or Kimbrough Hall. Quiz Bowl: After the outstanding contestants last year we’re excited to offer this opportunity again for your students to shine. More information about specifics will be included with your director’s packet. The baritones were the winners in 2017 and 2018. Let’s see who will win in 2019! Masterclass: Each year a member of the WSU vocal faculty present a topic. This is different every year! Wake-up/Sing-up: What to do with your students when they’re sluggish? Physical activities! This afternoon session will integrate music and physical activity meant to energize you and your students! Director Rap Session: Directors will have a structured time in which they are able to discuss ideas, repertoire, and continually strive to be the best they can be! Music Education Panel: Our music education students would love to have a chance to hear all of the wisdom you have after your many years “in the trenches.” We will have a structured time in which those directors who wish to meet with our WSU music education students can. Q&A with WSU Students: Your students have many questions about what it’s like to be a student in college. Our WSU men are excited to field their questions and to give them advice on a smooth transition to college. Here are some of the responses we received regarding last year’s festival. I liked that they were able to hear the power that comes when you have 250 guys sing together. They never get that experience! So that alone is amazing. It was so cool to have a room full of guys having a great time just singing together. The entire trip was a great bonding experience for my men. It also gave us some quality repertoire that we can use for other things. Being surrounded by so many more students “just like them”. My students came away saying things like “I made new friends today” and “thank you for encouraging me to come even when I didn’t think I wanted to come because I’m not a strong singer. It is an event that I foresee students looking forward to. I can’t wait to take stories about this event to my middle school feeder program and get those boys excited about this upcoming trip. The faculty and staff at WSU are looking forward to a wonderful day with you and your students! Should you have any questions please don’t hesitate to contact me. 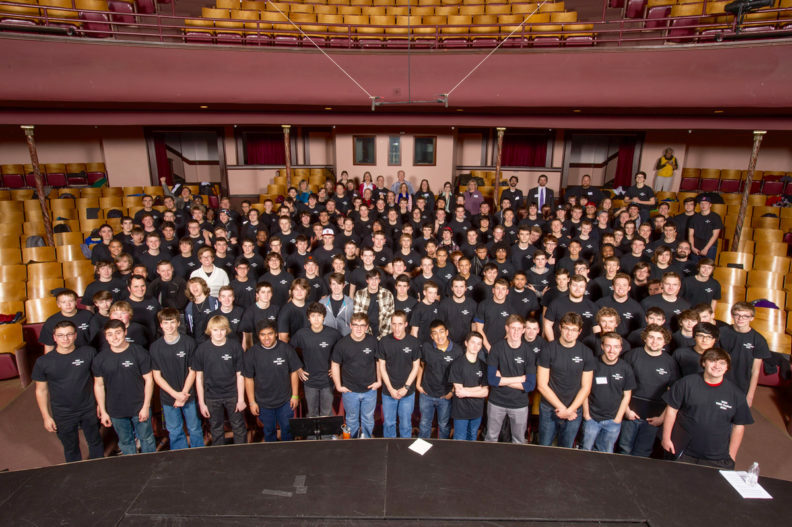 We look forward to seeing you this year at the 2019 WSU Young Men In Song Festival! For more information, direct contact via phone or e-mail is encouraged.